I've never personally cruised Kijiji Saskatoon to see if it's more than just hilarious spoofs and genuine oddball ads, but even if it's not, I love it. Now available in Saskatchewan - the bus shelter home. 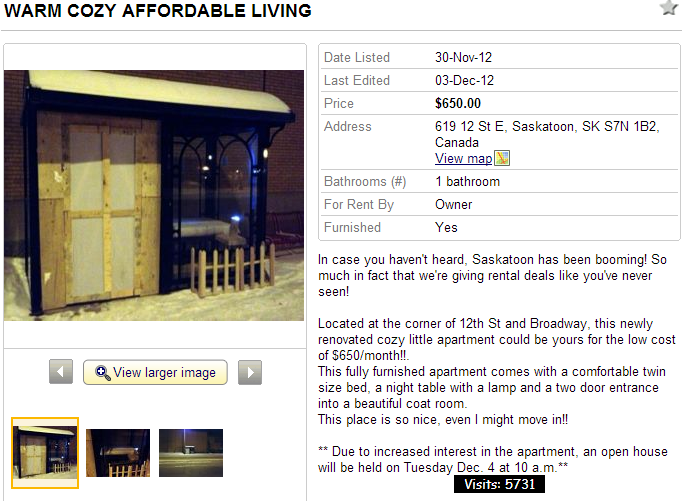 It's just like a Toronto condo, except with 30% less insulation. In case you haven't heard, Saskatoon has been booming! So much in fact that we're giving rental deals like you've never seen! Located at the corner of 12th St and Broadway, this newly renovated cozy little apartment could be yours for the low cost of $650/month!!. This fully furnished apartment comes with a comfortable twin size bed, a night table with a lamp and a two door entrance into a beautiful coat room. This place is so nice, even I might move in! !